I think this quilt is so pretty, so I wanted to share a photo. The quilt is by Carol Taylor of Beaumont, Texas. She named it “My Happy Quilt”. It is hand quilted. I love the colors and the various fabrics she chose. Each octagon is a work of art. The border is pretty too. 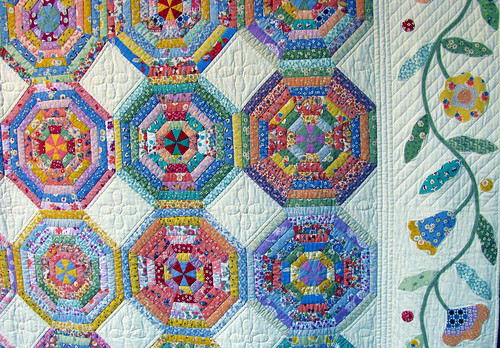 This entry was posted on Thursday, July 30th, 2009 at 3:00 am and is filed under Quilting. You can feed this entry. You can leave a response, or trackback from your own site.